Nagaland, the land of 16 indigenous tribes and their unique traditions, is located between Assam, Manipur, Arunachal Pradesh and Myanmar. Kohima is the capital city. The city of Dimapur bordering Assam is the main city inside the state having good connection with other parts of the country by road, rail and Airways. It takes about one and half hour to reach Kohima from Dimapur by road. Culture of Nagaland comprises of indigenous tribes following the traditions of their forefathers, but, most of them have been Christianized during the Colonial rule. One can expect modernized cities and people over there. However, the native culture is preserved through community festivals and local rituals. The Great Indian Hornbill festival is one such cultural gathering of all tribal people. It is the home for Hornbills, Tragopan (State Bird of Nagaland), and Mithun (domesticated Gaur species. The geographical terrain contains hill ranges. The region experiences cool weather throughout the year. It is one of the most hospitable destinations in North East India. Nagaland is served by one airport located at Dimapur. Connecting flights and direct flights are available to Guwahati and Kolkata. Dimapur is the well connected railway head in the state. Buses and rental taxis are available to travel around the state. You can stay either in Dimapur or Kohima. However, do not miss to experience village stays. Bamboo huts built in the model of the tribal huts provide you a different experience. Do not worry about the amenities. The huts and guest houses at the villages provide western facilities. Indian tourists are required to get Inner Lane Permit and foreign tourists no longer require the Restricted Area Permit (barring tourists from Bangladesh, China and Pakistan). Dimapur: This is an ancient city known for Ahom rule and the Kachari Dimasa rulers. It is said that the region in which the present day Dimpaur is located was the place of Hidimba (wife of Bhima) from the Mahabharata. At present the city is the gateway to Nagaland. Ruins of old Kachari tribe are preserved in the city. 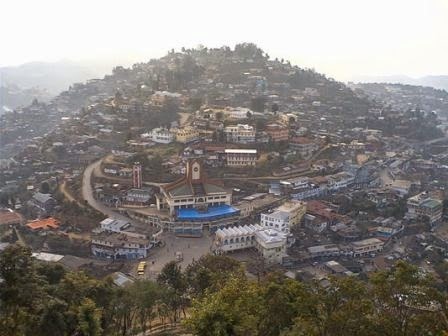 Kohima: This city witnessed the famous battle between the Japanese and the British forces during the Second World War. Visit the war memorial and the Kisama Heritage Village here. Make a trip during the first week of December; you would get to participate in the famous Hornbill Festival. Mokokchung: This district is the home of Ao tribe. Visit the Mopungchuket village. Mon: It is the home for the Konyak tribe. You can find the tribal people appearing in traditional tribal dress. This district borders Myanmar. The district hosts Aoleong Monyu Festival in April. Wokha: This is the home for Lotha tribe. This is best known for landscape, and fresh farm products. By Air - The state has only one airport which is at Dimapur, It's connected with Dibrugarh, Delhi, and Kolkata by regular flights. By Rail - Dimapur Railway station is the only railway station in Nagaland and it is connected to Guwahati and Kolkata. By Road - Taking a road to reach Nagaland is best way to visit Nagaland because the state has a good network of National and state highway with other major cities of India. You can opt or book private taxi or cab online from Dimapur, Kohima and Guwahati.